There is an ever increasing demand for telecommunication in public health. Today, uninterrupted data connectivity in this sector as essential as electricity and running water. Many countries have implemented or are in a process of implementing centrally based electrical “e-prescription” systems. The challenge with these online services is the need to connect to the central location every time the service is used. If downtime occurs on this connection, transactions cannot be made. Goodmill Systems Ltd. and Receptum Oy have jointly developed a solution to handle these commonly occurring data connectivity problems. Receptum offers a complete package of Pharmacy IT systems while Goodmill supplements the solution with always online managed broadband access. The solution guarantees in principle 100% availability for the necessary IT services. Best of all, the solution has been proven to be 60-70 percent cheaper than the competing solution in Finland and thus provides a payback period of only 6-7 months. The solution used is based on remotely managed routers that each have a fixed line and a mobile backup connection. When the fixed connection is not available, the router connects automatically to the systems using the alternative mobile link. This switchover time is very fast; unnoticeable to the users. The operators and mobile network technology can be freely selected based on local availability. An additional benefit is that the system provides seamless connectivity from both branch pharmacies and home offices. All connections are created automatically by the system and no local configuration is needed. The connectivity can thus be assured to all payment services, e-prescription databases and all other required applications. The solution is operator independent: the customer can select whichever operator offers the best prices. 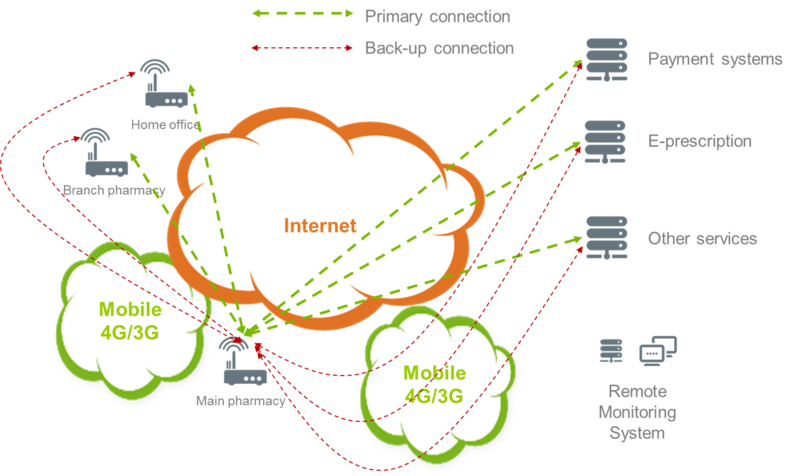 It is actually recommended that the customer selects different operators for fixed line and mobile connectivity for resilience reasons. It is very rare that two operators would fall down simultaneously. Operator independency also provides cost benefits. One does not need to buy high cost secured MPLS or expensive VPN solutions from a single vendor. The required encryption is provided by the router system. The system provides not only cost savings, but improved service quality overall. Data traffic may also be prioritized so that e-prescriptions and payment data will go through, even while higher bandwidth services are in use. This ensures that connections for crucial and critical applications cannot be blocked. The home office availability solution has been very well received. Pharmacy owners want to have full access to systems from their homes outside of business hours or during late evening opening hours. It has been one of the most demanded and widely used features of the system we offer. As the routers are remotely managed, the connectivity and the functionality of the routers and other back end systems can be continuously monitored. This ensures that the backup connection is fully operational even when not in use. All status reports and logs are securely stored and can be presented to the customer on demand. The customer can thus have a reliable report on the true availability of connections whenever they desire. Customers feedback is positive. Several pharmacies have indicated that customers come directly to buy the products from a place they know can provide the goods due to a well-functioning system. The presented backup solution is the market leader in Pharmacy systems in Finland. Receptum already has a customer base of approx. 400 pharmacies and more than half of them currently use the solution. Receptum strategy is to expand to other special retail sectors where uninterrupted connectivity is needed. The joint solution therefore has interesting growth opportunities. High availability IT solutions are here to stay. The branch has been looking for a more flexible player that is operator independent and offers more flexibility for the customers. Receptum and Goodmill have found a remarkable solution that is quickly expanding beyond pharmacies to dentists, medical centers and other specialist retail sectors. If you want a better service at a lower cost, don’t hesitate to contact us! Receptum Oy (Ltd) is dedicated to the provision and development of user friendly data-management systems delivery with over 20 years of experience in this field of business. Receptum provides IT-solutions and IT-services for commerce, pharmacists, dentists and dental clinics, doctors and medical practices. The extensive range of Receptum solutions also includes comprehensive bank and data transfer packages.